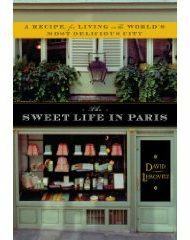 Disappointment is perhaps the best word to convey my feelings after reading Pete Wells’ article in this past Sunday's New York Times magazine section. In his article, The New Chicken Economy, Wells had the opportunity to share stories of how eating local, sustainable food is still possible even when grocery budgets are being considerably challenged. Frankly, I've come to far in my knowledge of what passes for acceptable farming practices to just turn about face and pick up a pack of beef that's questionable in nature or that's traveled across the globe to get to my plate. If you've been reading this blog for a while, then you know how much praise I bestow and respect I have for Grazin' Angus Acres (GAA). Not only is their poultry and beef full of flavor, it's raised in an ethical manner, roaming on pasture as animals were meant to do. Sure $6 a pound for chicken may sound steep, but with some creative culinary accounting, it helps feed us for two nights plus is the base for a pot of stock. Meat is like a guest star, providing just the right amount of protein, while being supported by a cast of starches, vegetables and fruit. The first night we enjoy it simply seasoned and roasted, and leftovers usually mean tacos—a hit in my house. I also know what Dan, my farmer, looks like. I know he just became a grandfather. I know his son just came back from Iraq. He also said something recently that left a lasting impression. I had asked when he'd have chickens available and he sad it would be a bit longer because only 80 of his 200 chickens survived what he thought was a weasel attack. The remarkable part of this story is that Dan accepted this as the price he pays to raise his animals in their natural environment. His only regret was that customers would have to wait a few more weeks for chicken. Grazin' Angus Acres has also been certified by Animal Welfare Approved—more to come on that in another post. I'm not saying it's my way or the highway. We all have different ways of meeting our family's needs. 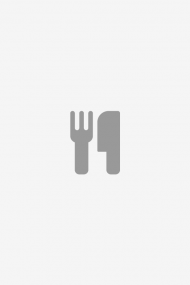 For ours eating consciously is a priority, and I'm not rolling in the dough (unless I'm making pies of course). I have made changes to the way I shop and consume so I can get the most value for my dollars. This may be TMI, but I've found CVS diapers work just as well, if not better than, as major brands and those extra dollars go towards the eggs my one-year-old loves to eat. I also started using cloth napkins, and while I hate doing laundry, I haven't spent a penny on paper napkins in over two years. I also started cleaning with past their prime dish towels, so that now we barely buy one roll of paper towels a week. That's just a glimpse—see, Pete, where there's a will, there's a way. This weekend's Greenmarket visit cost $58 and yielded a few bags filled with two quarts of milk from Ronnybrook, six quarts of strawberries (in crazy jamming mode), one pound each of garlic scape, snap peas, shelling peas, and asparagus plus one quart of strawberry cider, two pounds of apples and three zucchini from Maxwell Farms, Philip's Farms and the apple guys at the entrance to Grand Army Plaza in Brooklyn. When it comes to fruit and veggies, the trick is to window shop. The prices vary from stall to stall and that can mean a difference of $1.50 per quart of strawberries as I noticed this weekend. I’ve been enjoying pesticide-free spinach for weeks now at $2 a pound. 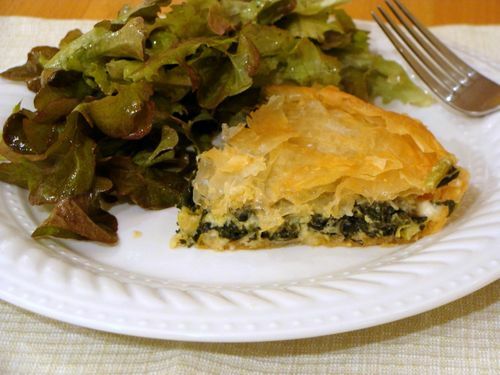 I’ve made it creamed, sautéed and tossed into pasta, frittatas and recently decided to revisit my spanakopita recipe, a Greek spinach pie, so that's the recipe I'd like to leave you with today. Many recipes prepare spanakopita in a sheet pan, but I remembered a few years ago I learned a different approach from a friend whose dad owns the venerable Greek restaurant Gus’ Place in the West Village. She recalled the summers she spent in Greece watching the women in her family assemble spanakopita in a large round pan. I decided my 9-inch ceramic pie plate would be the perfect backdrop for my recipe. Served with a salad of lettuce I grew in my own backyard, it was a well-balanced meal that didn’t break the bank. In some ways spring is the perfect time to make spanakopita since spinach is one of the early crops. Leeks are also in season right now, so feel free to substitute them for the scallions in this recipe. And don’t throw away those tough green tops—they’re perfect to toss into a pot of simmering stock with your leftover chicken carcass. 2. Heat olive oil in a 10-inch skillet over medium heat. Add scallions, and sauté for 1 to 2 minutes until they begin to get tender. Add spinach and continue cooking until spinach is wilted and scallions very tender, about 3 to 4 minutes. Stir in dill and nutmeg; transfer to a deep bowl. 3. Stir in crumbled Feta cheese; season with salt and pepper. Stir in beaten egg. 4. Using a pastry brush, coat a 9-inch by -2-inch pie plate with melted butter. 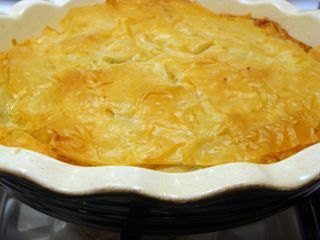 Place one sheet of phyllo in plate so that half of it hangs over the sides; brush lightly with butter. Repeat with remaining sheets, overlapping the layers, until you’ve created a “pie crust” with layers of the phyllo. 5. Spoon filling into pie plate. Gently fold the overhanging sheets of phyllo, one at a time, to cover the top of the “pie”, remembering to lightly brush each layer with melted butter. Bake for 25 minutes, or until puffed and a deep golden color. Let stand five minutes before cutting. 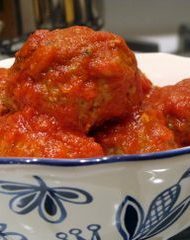 enjoyed reading this post and especially the recipe with all the pictures, this needs to be tweeted! Great post! We all need to be more conscious of where are food comes from. Barbara Kingsolver’s book “Animal, Vegetable, Miracle” really opened my eyes to these issues. Your recipe looks delicious. I read the whole thing…great post! I’ve been wanting to make Spanakopita lately since my 22 month old likes it every time he gets a bite. This seems like a great starting point. Thanks! I’m so happy you’re all enjoying this post. I used to make spanakopita with lots of phyllo layers and don’t even look back after this prep.